We always appreciate extra sets of helping hands at CFCS, perhaps no place more than at our residential programs Teens Learning Choices and Putnam Place. 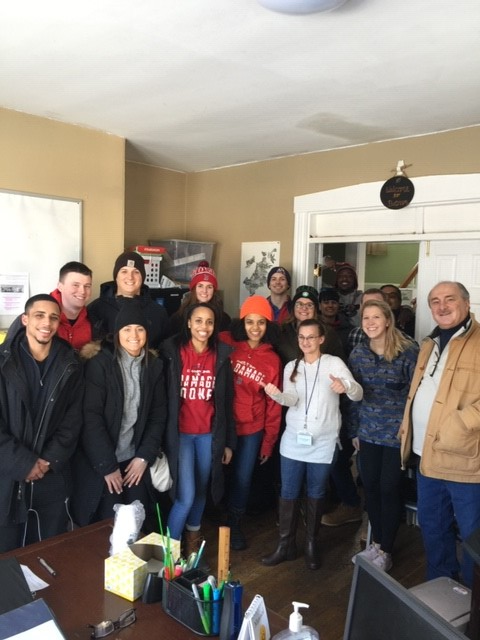 That’s why we were so happy to have volunteers from the Red Sox Foundation come by Putnam Place at the very end of February to do a deep winter clean of the interior of the house! A grand total of 15 enthusiastic volunteers came to brighten the walls of Putnam and the day of everyone living and working there. We know our supervisors and counselors appreciate this huge help, but the young men who live in Putnam are especially happy to have their home fresh and clean for spring. Thank you to everyone at the Red Sox Foundation for making the lives of the youth served at Putnam a little better! CFCS would like to extend a special thanks to Donna Gittens at MORE Advertising, as she worked to connect our organization with the Red Sox Foundation. We rely on support from business leaders like Donna to foster these important collaborations that serve our clients!